Rumors had been churning for a few weeks now about a Facebook phone, and more recently there had been talks of a Facebook phone built by HTC. 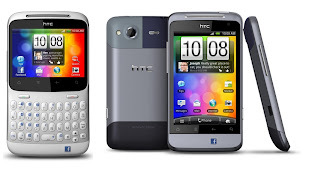 Both rumors were vehemently denied by Mark Z of Facebook but recently HTC has revealed that they are the real deal (sort of, if by "Facebook phone" one means dedicated Facebook buttons). Both, these "Facebook" phones, are running pretty barebone hardware in this day and age, but seeing as they are social networking devices it's understandable. Packing a 600MHz CPU, a healthy 512MB of RAM and 5MP camera with Flash as well as front facing for video chatting, these aren't phone that are going to be bleeding edge fast but should be good enough for all your social networking needs. The Salsa (on the right) is packing a 3.4-inch capacitive touch display. Looking somewhat like a redesigned HTC Legend. While the ChaCha (on the left) has a 2.6-inch touch screen with full QWERTY keyboard, which is somewhat of an uncommonly used form factor by HTC, although it does bear some resemblance to their Blackberry-esk HTC Maple/Snap. On a somewhat odd yet interesting side note, according to a old 2010 HTC roadmap leaked on XDA the Salsa was the codename for a portrait QWERTY smartphone not unlike the ChaCha. Name confusion ensues. No word on them heading to Canada just yet, but with word that they might headed to AT&T, who share the same 3G bands with Rogers/Bell/TELUS in Canada, there are good chances we will see them sooner than later.